To reduce medical expenses is important if you have low source of income and you are interested to reduce medical expenses. Steps of reducing medical expenses are not top secret. Patient or everybody can reduce the cost of medical bills if he or she will use his or her logical sense of mind. This article will help you to teach its simple steps. 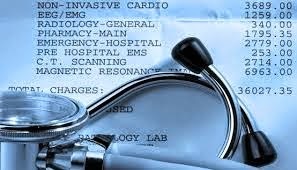 To record all the medical expenses on the basis of bills is essential if you want to reduce medical expenses. When you will record, you can see your total expenses. You can compare it will your medical budget. For example, you have fixed medical budget of Rs. 5,000 per month but your accounting record is showing, you have spent on medical Rs. 10,000 in June. Now, you have obtained the reason of inquiry. Why did our medical expense come double. What is its reason. During the research, you can find, you are responsible for this. You have eaten outside fast food. With this, you have faced the infection in liver. So, for removing infection, you have spent. So, you can take the better decision to stop all fast food outside. In previous winters, I spent more money on medical because I was not so careful about my health. But now, at this current summer time, I carried it at Rs. 0. So, accounting records of medical expenses will be so helpful for providing important information and also helpful for taking better decisions for reducing expenses. One more benefit to record on the basis of bills, if you are govt. servant, you can get reimbursement of medical expenses from Govt. by showing your actual medical bills. Today, there are lots of medical substitutes in the market. For example, you can treat your disease with allopathic or homeopathy or naturopathy or ayurvedic or unani medicine. So, out of these way of treatment, you choose best and cheap. As per my experience, naturopathy and ayurvedic medicine is so cheap and risk free. Few years ago, my fever did not stop with any allopathic medicine. Then I started to use naturopathy because I had practiced it in past. Without any cost, I come out of my chronic fever. If there is case of accident, allopathic is best in case of emergency. So, before treating yourself, try to search medical substitutes which should be cheap and best. It will reduce your medical cost. Every hospital provides different services and advice. So, prices will not same. But still, we can compare the cost before treating practically. Just search the internet, you can know different doctors' numbers. Just call them with their mobile no. Ask the first question, "What is the fees for this?" Now, write and compare it before going to treatment. Now, follow best and cheap doctor in the market. When you have to treat any disease, try to search doctor in near area. You can also use google by write the disease or doctor for special disease and write also your near place. Main reason behind this, it will reduce your transport cost. It also less disturb to patient. All medical books are so cheap. As my thinking, any one can doctor if he or she is the book lover. Study all types of books by buying them from market.You can find great treasures of treatments. Use them and save the cost of medical bills. Learn everyday about the treatment online. Get references of great natural medicine. God has made all natural medicine, so, you can get them at free of cost. Never take medical debt. It will increase your stress and stress will make your patient in whole life. Do exercise and yoga asan everyday and save your life from all chronic diseases. More you save more your medical expenses will reduce.